Content marketing is now at the heart of marketing and we can see how important it is since marketers rated it as the most important technique for driving incremental sales in 2017 in our 2017 marketing predictions article. But what is content marketing? It means different things to different people. So, content marketing involves a huge number of different potential formats and content distribution mediums which we recommended are mapped as explained in our free Top 10 content marketing mistakes guide (using the Content Marketing Matrix and Distribution Matrix at the bottom of the article). It is mainly used as a digital marketing tactic, delivered online, but there also many forms of effective content marketing which are offline. Because online media publishers are engaged in a fierce battle for the attention of consumers, content marketing is becoming ever more competitive. This is driving rapid change, as competition drives innovation and ever more compelling ways to win consumers attention. In such a rapidly changing environment, it is helpful to keep an eye on the competition and where the industry as a whole is headed. This means it's important to have accurate statistics to hand to both be able to accurately chart where the industry is going, and to use to appeal to CMOs, CEOs or CFOs when making the case for budget. How many are using content marketing? Content marketing has become an almost universal tactic, with almost 90% of companies using it in 2016, and even more utilizing it in 2017 (Source). 75% of companies increased their content marketing budget in 2016, and 43% increased the staffing levels of their content marketing departments (Source). Every minute, 1440 WordPress blogs are published, and 500 hours of content are uploaded to YouTube (Source). Although though there are 38 million searches on Google every minute, the vast majority of these go to major established sites- leaving many brands competing with thousands and thousands of other content providers to come top of the pack. How many brands have a content marketing strategy? Research conducted by Rebecca Lieb of Altimeter Group found 70% of marketers don't have an integrated strategy (Source). But research from LinkedIn found 72% of marketers did have a strategy in place for content marketing (Source). This suggests somewhere in the region of half of all content marketing strategies are not integrated with the rest of the business strategy, which can present big problems and poor communication between departments. What platforms are marketers using for content marketing? 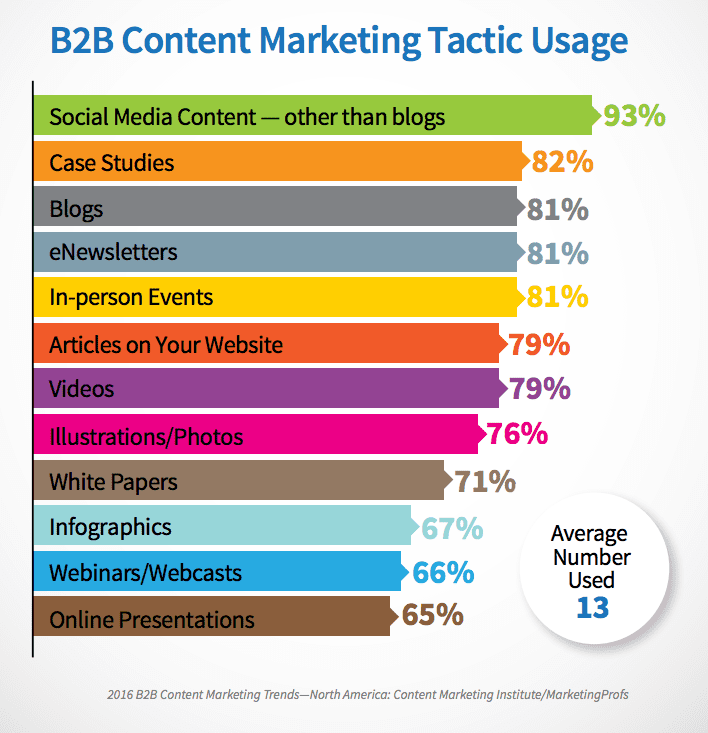 Social media content and case studies are the most popular forms of content marketing, according to the 2016 B2B content marketing trends report. Blogs and email newsletters are also very popular, with 4 out of 5 blogs using them (Source). When it comes to blogging, which is both one of the most popular and most effective tactics, there are many content management systems (CMS) that can be employed to manage the process of publishing content online. 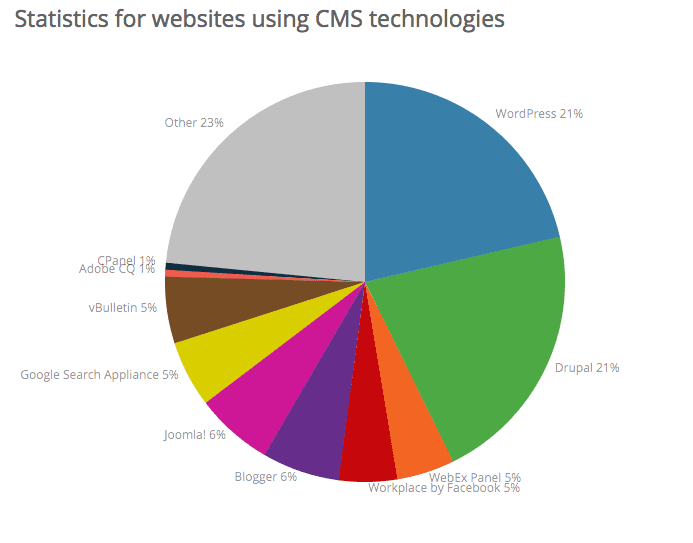 The data from builtwith.com shows WordPress and Drupal are clear leaders when it comes CMS, although there are many other smaller providers (Source). Are brands successfully measuring their content marketing ROI? 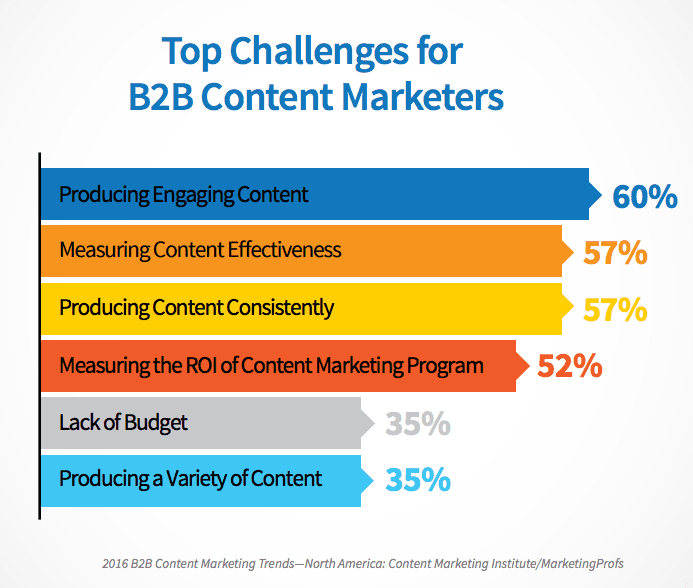 52% of B2B content marketers report measuring ROI as among their top challenges, suggesting more than half of B2B content marketers are failing to properly measure ROI (Source). This is the 4th most common content marketing problem, behind producing engaging content and measuring content effectiveness. Ability to track ROI varies considerably by businesses size, with the smaller players often unable to track it as effectively. According to an eMarketer study, 6 in 10 small businesses are not able to track ROI from their social media activities (Source). 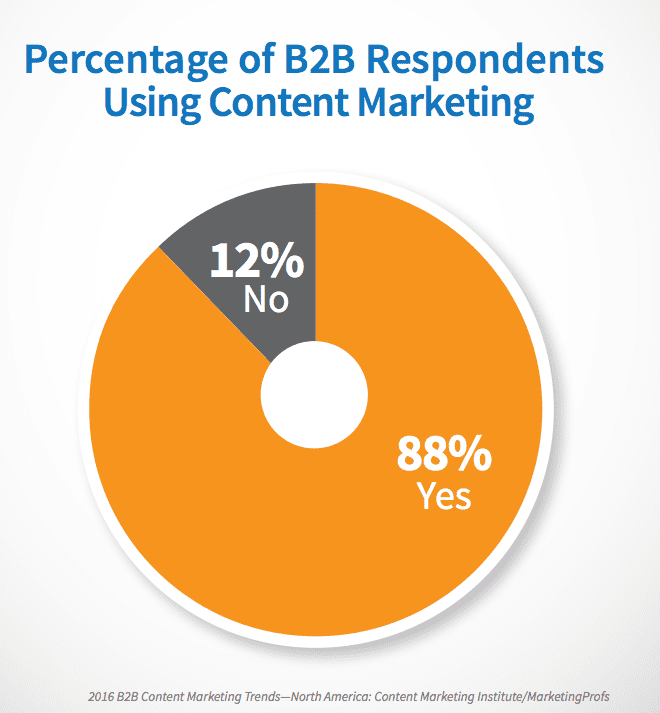 That's for B2B content marketers, but what about content marketing as a whole? SmartInsights partnered with HubSpot to survey European content marketers, and found that 51% of content marketers are either not measuring ROI or are struggling to do so (Source). Is content marketing entering the age of 'content shock'? Mark Schaefer has been talking about the impending problem of 'content shock' for a few years now. Essentially he theorized that whilst content production will increase exponentially as more and more brands pile in on the action, the rate of increase in content consumption will only increase slightly and then inevitably plateau. This is because we only have so much time with which to consume content. Therefore content marketing will become a victim of its own success, and brands will find that the same techniques become less and less effective each year. The question on the lips of many is, are we now in the era of Content Shock? 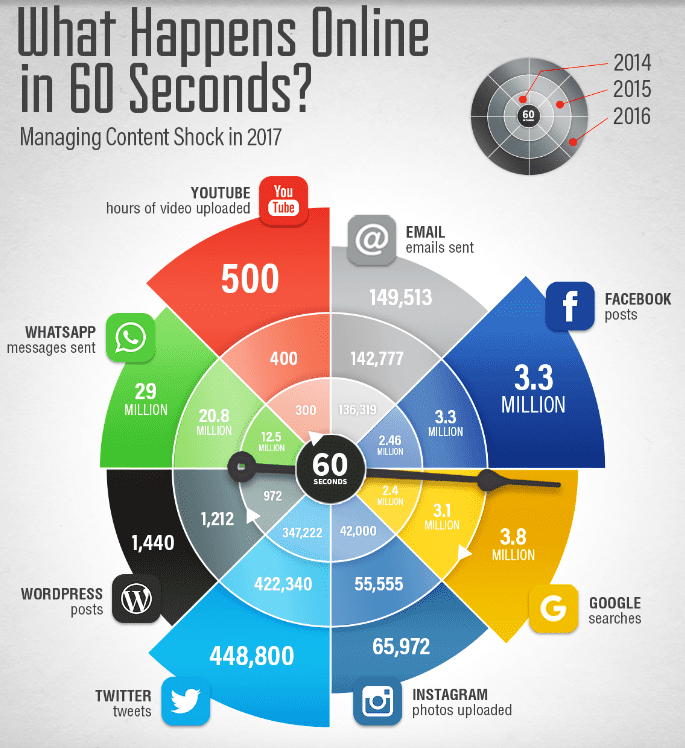 The graphic below shows the crazy amount of content created every 60 seconds across the web. Competing with the 3 million Facebook posts, 1400 blogs and 500 hours of video content published every minute, is difficult to say the least. If you are feeling overwhelmed by the amount of content you're competing against, you need to develop a strange which focuses on your strengths and lets you win in your competitive niche. Only by becoming highly specialized can we hope to have any hope of beating content shock.